"ANZAC Day is a national day of remembrance in Australia and New Zealand, originally commemorated by both countries on 25 April every year to honor the members of the Australia and New Zealand Army Corps (ANZAC) who fought at Gallipoli in the Ottoman Empire during World War I. It now more broadly commemorates all those who died and served in military operations for their countries. This is a very important day in those countries and particularly for the Veterans. The Aussies and Kiwis have always been there for us so please take a moment on April 25 each year to say a prayer for all the brave souls who sacrificed so much for their countries. "As a country ANZAC Day is possibly the most important National day we commemorate. In Sydney city the Dawn Service of Commemoration begins at 4.30am (The time the first members of The 9th Battalion landed on ANZAC Cove at Gallipoli, them being the first of the Australian and New Zealand troops to land on Gallipoli in Turkey that morning so long ago in 1915) in the darkness of a Sydney morning, and is held at the Cenotaph in Martin Place. The Service takes about an hour, four out of the last five years it has pelted down heavy cold rain and yet there have been in attendance between 10,000 - 13,000 people at these ceremonies, many watching the Official Ceremony on large outdoor TV screens further up Martin Place. Among the Official Guests is The U.S. Consul General to NSW. If there is a U.S. Navy warship in port usually one of the senior Officers also attends. This is a very moving Service, and finally as the flags are raised to the last haunting notes of Reveille echoing through the canyons between the buildings, and the Catafalque party marches off to Waltzing Matilda, the first rays of dawn are seen in the east. All across Australia and New Zealand, from large cities to small country towns and hamlets ANZAC Day is commemorated. Following the Dawn Service around 9 a.m. there is the March in Sydney followed by reunions, many going on well into the night. "This is a very important day in New Zealand, Australia and Turkey. Being The 100th Anniversary of the Landings on the Gallipoli Peninsula, there were many Commemoration Services starting in New Zealand, then across Australia, then on to Turkey, then France and in England. Very early on Saturday morning 25 April 2015, we saw a Commemoration Memorial Dawn Service in the New Zealand Capital, Wellington on T.V. In Sydney the Dawn Service is held at the Sydney Cenotaph in Martin Place in central Sydney and we arrived there at 1.30am, as large crowds were expected. By 4.30am when the Dawn Service commenced there were between 20,000 to 30,000 people in the darkness. Martin Place was wall to wall people. The haunting tones of the bagpipes and the call of a single bugler during the Last Post and Reveille shattering the silence and darkness in the massive canyons created by the many high rise buildings, make this a very moving service. 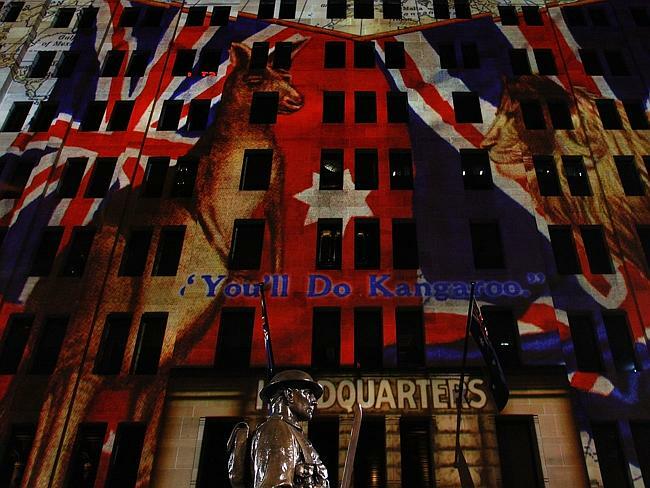 During most of the Service, there is a very good laser light show of pictures and posters from 1914-1915, projected onto a building wall next to the Cenotaph. The Dawn Service is commenced at 4.30am local time, as it is generally accepted that the first Australian soldier of the Allied invasion force (from The 9th Battalion of The 3rd Brigade set foot on Turkish soil on the beach at Ari Burnu (ANZAC Cove) at 04.30hrs, Sunday 25 April 1915. 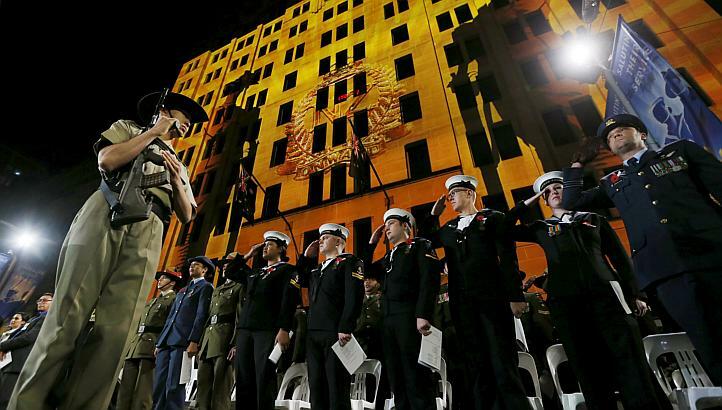 All across Australia on Saturday morning there were Dawn Services. We passed many finishing off in the Sydney suburbs on our way home. A 100,000 people attended the Dawn Service in Melbourne, and I believe the TV commentary was that 1/3rd of the population of Canberra, attended the National Service at The Australian War Memorial. Many of the small towns across the country have populations of 3,000 to 4,000 if that at most, yet they hold their Dawn Services. Later in the day we saw on TV the Dawn Service at King's Park in Perth, Western Australia (Western Australia has a two hour time delay to Sydney and Melbourne). However, in the darkness and cold of the Gallipoli Peninsula, Australians, New Zealanders and Turkish people who had been nominated or obtained tickets to attend waited in the darkness for the Official Dawn Service at North Beach (one beach north of ANZAC Cove). There watched over by 4,000 Turkish Police and Security Forces with the people, were the Turkish President, the Australian and New Zealand Prime Ministers, plus Prince Charles and Prince Harry from England. Off the beaches were 10 warships from Turkey, France, England, New Zealand and Australia. 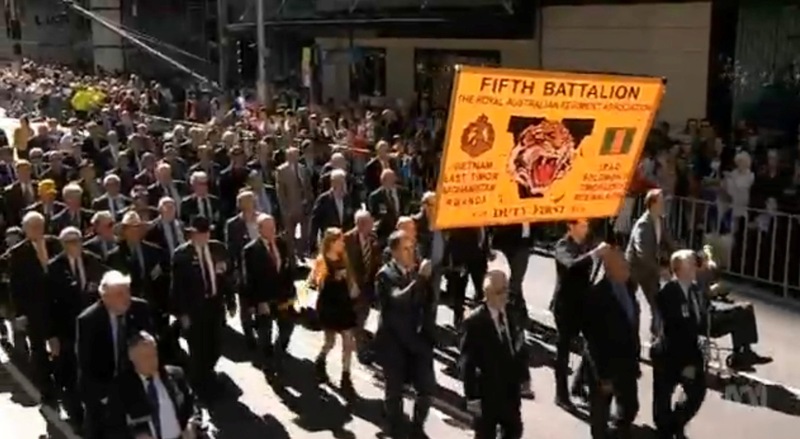 In Sydney we have an ANZAC Day march which commences at 9am, and we from the Army of the Vietnam era began our march through the city at 11.10am. Thousands and thousands of people had come into the city and we received a tremendous reception. Many high fives with the crowds as we marched by. This was very good. Then we went to our reunion, for a few beers and a meal. While at the reunion, we saw on TV the ANZAC Dawn Service at Gallipoli, then the later Memorial Service, up the hills there at a place called Lone Pine. This commemorates a battle fought there between 6 - 10 August 1915. Later in the day we saw on TV a Commemoration Service in France attended by 6,000 people in the darkness and rain at a place called Villers-Bretonneux where on 25 April 1918, exactly three years from the day of the ANZAC landings at Gallipoli, the Australian Army stopped the World War 1 great German Army 1918 Michael Offensive. This is a duel Commemoration Service for both the ANZAC Day landings at Gallipoli in 1915 and the successful Australian night attack 24 - 25 April 1918 at Villers-Bretonneux. There is an Official National Australian War Memorial at Villers-Bretonneux. Later last Saturday we saw on TV, the Queen and other members of the Royal Family attend an ANZAC Day Memorial Service in London. It is a long, memorable and thought provoking day. There are some sad and many good memories of our Mates. Sydney's weather was kind, until the evening when we had a hail and thunder storm with very heavy rain. I have attached some photos of the dawn service and a TV still of the march. That was my ANZAC Day in Sydney.